Suzhou (pronounced soo-joe) is one of China’s cultural and historical capitals. Founded in 514 B.C., Suzhou flaunts 2,500 years of history and a myriad of ancient temples, palaces, gardens, canals, and fortifications. The city's magnificent UNESCO World Heritage Sites include the stunning Grand Canal and dozens of classical gardens. The city is also known for the production of silk and a vibrant history of the embroidery craft. Though the city of over 10 million people has no airport, Suzhou is very easy to get to. It's located midway down China's Pacific coast about 70 miles inland from Shanghai (the bullet train from Shanghai's Hongqiao International Airport takes just 30 minutes). English is widely spoken, ATMs are prevalent, and the city is safe and comfortable (though traffic can be annoying). Whether you're visiting on a day trip from Shanghai or have a couple of days to dedicate to the city itself, here are the top things to do in Suzhou, China. The oldest part of Suzhou is what China was like before cars and motorbikes. The 14.2-square-kilometer Old Town is ideal for wandering, either on foot, by bike or via a lazy gondola ride. Steep-sided bridges arch over 35 kilometers of 1100-year-old canals, and narrow, picturesque, cobblestone streets meander through the whitewashed walls and black roofs of the Old Town. Popular pedestrian shopping thoroughfare Pingjiang Road has been found on maps since 960; a canal that may be even older runs alongside the street. Lively Shantang Street is famous for its temples and memorial bridges arching over bigger, busier streets. ​Sinquan Street boasts architecture from the Ming Dynasty, which was in place from the mid-1300s to mid-1600s. Don't miss a canal tour in Old Town Suzhou. You can a catch ride on the Grand Canal or smaller, adjacent canals. From the water, you'll see a whole other face of Suzhou, where traditional homes open directly onto ancient waterways. While in Old Town Suzhou, head to the Jinchang District’s Shilu Shopping Street for goods old and (mostly) new. In the evening, the traditional Kunqu Opera, which dates back to the 14th century, is still performed in a number of theaters in Old Town. Or, follow Suzhou's moat on foot along the 15.5-kilometer Ancient Moat-ring Fitness Trail. Opened in 2016, this picturesque trail follows Suzhou's ancient moat to form a circuit around the entire Old Town and can be completed in around 4 hours of continuous walking. Tiger Hill is one of the oldest parts of Suzhou, and gets its name from a legend. In 496, after King Wu buried his father on top of the hill, a white tiger appeared to guard the tomb. The local explanation for fog over Tiger Hill? It descends to conceal the tiger. Set just a couple of miles from the center of Suzhou, Tiger Hill is like a whole other world. Picture this: canals meandering through ivy-covered embankments; tranquil glades of shade trees and flowering shrubs; ancient black-roofed, white-walled cottages. Enter through a dramatic ocher gate and climb the steps to Yunyuan Temple. Its imposing Leaning Pagoda was built 1,000 years ago between 959 and 961 (beating the Leaning Tower of Pisa by around 150 years). Below, the mysterious, grotto-like Sword Pool is said to harbor King He Lu’s 3000 swords in its watery depths. Suzhou's largest bonsai garden is also at Tiger Hill. At the foot of the hill, Wangjing Villa offers a half-acre of potted miniature bonsai trees, some over 200 years old. The villa's beautiful dwarf trees are complemented by rocks and other features intended to create miniature landscapes of Suzhou and China. You may spy a master gardener trimming the bonsai with delicate traditional tools. 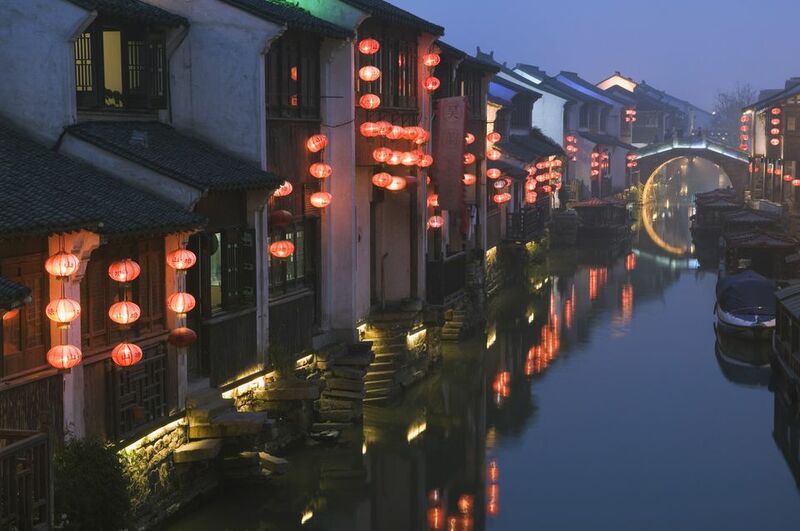 Southeast of Suzhou lies perhaps one of China's most Instagrammed attractions: the 1100-year-old Tongli water town. Once an active fishing village — the lakes surrounding Suzhou are fertile grounds for perch, shrimp and hairy crab — since 1994 the town has existed as a sort of historic amusement park, where large groups of tourists cycle through a beautiful meditation garden, line up for boat rides along tree-lined canals, and enjoy traditional performances while munching on barbecued pork parts. On the face, Tongli can come off as overwhelmingly touristy. But there's a layer of reality hidden beneath the town's surface. Enjoy lunch at the luxe Xishantang Buddhist vegetarian restaurant designed and created by a member of a wealthy silk industry family (design buffs should even book an overnight stay at Xishantang's luxurious sister property, the Taimuting Hotel). Suzhou is home to over 60 historic gardens, nine of which are recognized for their "outstanding universal value" by UNESCO; the city is one of the foremost destinations in all of China for garden enthusiasts. The 500-year-old Humble Administrator’s Garden is the largest of nine UNESCO World Heritage Site gardens in Suzhou. Its breathtaking beauty harmonizes the four classic elements of Chinese gardens: plants, rocks, water, and buildings. Built in 1509 during the Ming Dynasty, this 13-acre garden belonged to a retired government official who wanted to live out his life in beauty amidst nature. If you can handle the crowds, allow some time to explore. Every inch of the garden is manicured to perfection. You can step from classical interiors decorated with Ming dynasty antiques, to mini bamboo and pine forests, to lotus pools, to open courtyards of varying sizes. Get lost in nooks, crannies, lookouts, caves (yes! ), pagodas, secret gardens-within-gardens, and meditative water features. Another UNESCO site from the Ming Dynasty, the Lingering Garden is elaborately designed, with numerous pagodas, halls, and other buildings. It's half the size of the Humble Administrator’s Garden, and much more architecture-focused: a manicured jewel. Every few steps reveal a new scene, many of which are framed by windows and sculptures. The overall structure is divided into four connected parts, with an ancestral temple and houses. All of the garden's mosaic-tiled paths through the Lingering Garden lead to one of the most famous rocks in Suzhou — the centuries-old Crown Cloud Peak stands impressively amidst pagodas and lily ponds. The garden's bonsai collection of more than 1000 plants is another must-see. The 900-year-old Master of Nets Garden is best visited at night, when the day's crowds give way to small groups of visitors cycling between eight separate traditional performances of Kunqu opera, music and dance. These performances take place after dusk between April and October and English guides are available. The metropolis of Suzhou expands way beyond the moat surrounding its Old Town. The Suzhou Industrial Park (SIP) is home to the city's most modern hotels and shopping malls, which line the massive Jinji Lake. Opened in 2017, the W Hotel Suzhou is today the most stylish address in town. The hotel's architecture is worth a visit alone, with interior design representative of a contemporary take on the floating garden. Large crowds of tourists gather on the edge of Jinji Lake each Saturday night for the city's massive weekly fountain show. But the W's Toro Loco Spanish restaurant and rooftop bar is the perfect spot to witness the fantastical coordination of water, lights and music from above (and with a cocktail in hand). The W is also connected to Suzhou's huge new shopping mall — the Suzhou Center Mall. Here visitors can ice skate on an Olympic-size rink, horseback ride or ski indoors, take supermodel lessons, and eat everything from frog to food court fare. SIP has its amusement-park side, too. The Suzhou Ferris Wheel, Asia’s largest, captures an incredible view of growing Suzhou and vast Jinji Lake, In SIP, you can rent boats to see the city from Jinji Lake, or visit man-made Peach Blossom Island and Exquisite Island. The modern Suzhou Museum is home to a dazzling array of artifacts from Suzhou’s millennia of settlement. Built in 2006, the museum was designed by U.S.-based, Japan-born architect I.M. Pei. Its black-trimmed white exterior is an ultra-modern interpretation of traditional Suzhou houses — the museum's design is quickly becoming an architectural icon. The museum owns more than 15,000 objects. All aspects of Suzhou culture are represented here. You'll see everything from truly ancient unearthed relics to classic Chinese arts (paintings, calligraphy, porcelain, carved gems). You can also enter recreations of ancient Chinese homes. Visit the museum in conjunction with a trip to the Humble Administrator's Garden — the two are nextdoor neighbors and a visit to this crowded part of town is best conquered in one go. Silk has a long history in Suzhou. Production of the famed fabric here began around 2800 years ago. Silk Factory No. 1 — opened in 1926 and today serving as a museum to the craft — offers an inside glimpse at the strange, fascinating process of silk-making. It's true: silk is spun by worms. The museum's walk-through of the silk life-cycle is strangely compelling: from worm to luxury fabric. You'll watch silkworms eat mulberry leaves and spin their cocoons. Then you'll see how the silk cocoons are processed. Human hands and machines wash the cocoons and extract the silk threads. There are two types of silk cocoon: one for making bedding and one for fabric. Bedding is made by hand by women who are expert "silk-stretchers." Fabric is woven by giant machines using thread just pulled from silkworm cocoons. And, of course, an extensive selection of bedding, clothing, and gifts is sold in the museum. Prices are competitive with anywhere in Suzhou, and the proceeds help support the museum. Suzhou cuisine is milder, softer, and sweeter than Shanghai dishes, even though the cities are neighbors. Most dishes are mainly protein (meat or seafood/fish) or vegetables, with a minimum of rice or noodles. Plain white rice isn’t generally served unless you request it; rice dishes are usually mixed with pork and vegetables, or just veggies, especially mushrooms. A banquet dinner is a highlight of a Suzhou visit. The meal will be multi-course, with a wide range of dishes. Unless you're dining solo, food is served family-style. You’ll probably start the meal with congee (a mild rice soup or porridge) and hot green tea. Then small, freshwater shrimp or other lake-procured shellfish, simply prepared. Soft tofu in a rich, salty chicken broth might come next. One meal highlight could be the popular "Mandarin fish," a fresh local fish cut artistically, tempura-fried, and doused with a delicate, sweet dressing. Super-fresh greens are cooked gently, often just with some garlic and a bit of oil to preserve flavor. Mushrooms, varying with the season, often get their own very tasty preparations. In spring, try watercress, a tangy, leafy, emerald-hued green. Water shield is another typical local green, grown in the lakes so prominent in the region. Two of the best spots to enjoy a typical Suzhou-style meal include Laochangmen, near Shantang Street, and Xintianlunzhile in downtown Suzhou. Alongside silk products at any of Suzhou's souvenir shops you'll also see embroidery. Suzhou is known for the ancient art, which here often displays scenes of nature — kittens and goldfish are recurring themes in the region. To see local embroidery artists in action, head to the Suzhou Embroidery Research Institute, where you can try your own hand at the Su style of embroidery, and browse some of the most impressive examples of this regional style of the Chinese art. Considering the amount of embroidery and silk production going on in Suzhou, it's not surprising that the city is known for its bustling wedding dress trade. What is surprising is the sheer number of dress shops lining the alleyways of the wedding dress market near Tiger Hill — hundreds of boutiques, big and small, offer pre-made or tailor-fit designs at fractions of what they'd go for in Western countries. Getting lost amongst the alleys of white and red dresses is a must in Suzhou. But to see the most impressive designs you don't need to wander further than the market's front row of shops, where high-end boutiques like Jusere and Denise display their most recent runway creations. Forget Pirated DVDs, See the Next Hit on the Big Screen in China!